Mead 0.3l warm or cold depending on weather. 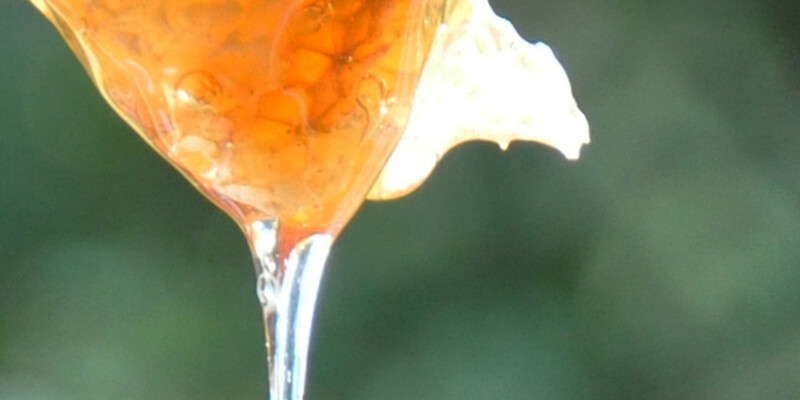 Handcrafted from local honey. Made of “Alb-Leisa”, a local type of lentil. With or without sausage. A simple stew that has been there for centuries. Depending on season we use produce grown on site. 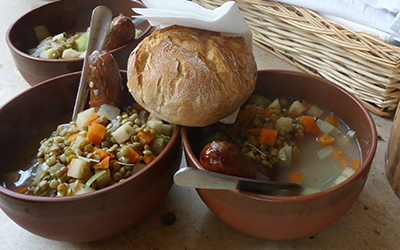 The stew is freshly made daily and comes with a spelt-wheat-rye bun and upon request a Carolingian sausage. Ein einfacher Eintopf wie es ihn seit Jahrhunderten gibt. Je nach Saison und Verfügbarkeit verarbeiten wir darin auch unsere eigene Ernte. Der Eintopf wird täglich frisch zubereitet, schmeckt hervorragend, ist gesund und macht satt. Dazu gibt es ein „Bodenseebrötchen (Dinkel/Roggen/Weizen)“. Auf Wunsch bekommen Sie dazu auch eine karolingische Wurst. The ancient Romans already made sausage made of coarsely-ground meat. At the time it was stuffed into animal stomachs rather than intestines. 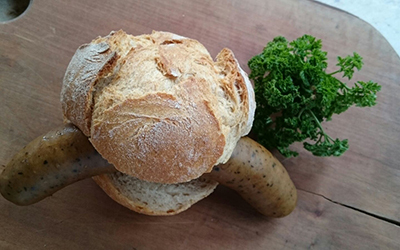 We acquire the sausage from the local butcher “Metzgerei Knoll”. 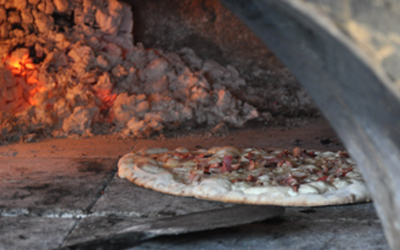 It is specifically made for Campus Galli without flavour enhancers and nitrite curing salt. That’s why it is not as red as modern sausages. 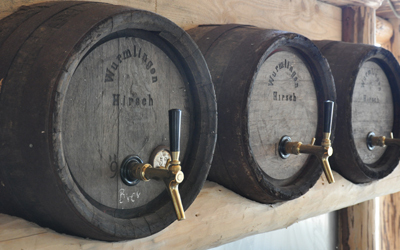 The meat is locally produced coming from the neighbouring villages Vilsingen and Rohrdorf. Some of the herbs used for flavoring are listed in the St. Gall Plan. For groups we recommend ordering the food together with your booking. Then the kitchen staff will prepared and you avoid waiting times. We are sorry for not offering coffee on our site. As coffee only got to Europe as late as the 16th century, it simply didn’t exist in carolingian times. But on cold days you can get a nice warm cup of mint tea. Mint is mentioned in the plan of St. Gall (though no peppermint because that was a crossing that only came to be known in the 17th century).